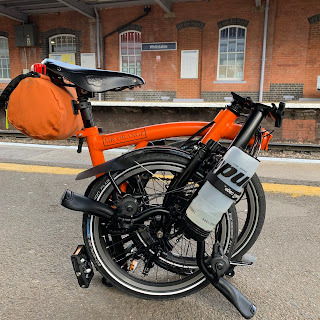 My Orange Brompton: Unable to do the Dunwich Dynamo! Regular readers will know that last week I went on a 80+ mile ride from London to Whitstable. It was a great ride and afterwards I suffered not ill effects...at least I thought I hadn't. On Monday morning I felt a tightness in my left knee. It was as if my knee had been overworked and was rebelling against the possibly of being put to work again by cycling to work. I decided to rest it for a few days in the hope that by today I would have recovered enough to go on the 120 mile Dunwich Dynamo I had been building up to and looking forward to all year. I have to say that things did look better towards the end of the week but this morning I made the decision to abandon all hope of attending this year. As I type this my knee feels okay but I suspect it will be a few more days yet before I can say it is back to 100%. Reasons? Well my first thought goes to the clipped in pedals. At 80+ miles this was the longest journey I have made on them and I cannot help but put two and two together. I don't think that on the actual ride I overdid things or used incorrect gears for too long. I have to point to the cleats and their position on the shoe. More specifically the left shoe. It was disappointing not to go today. My heart was telling me that I could quite easily cope. My fitness and stamina could cope quite easily and my knee was feeling good. However, my head was telling me that if this knee pain took the best part of a week to go away (almost) going on a 120 mile ride would not be a smart move. In addition to this the Brompton World Championships is next weekend. This is THE highlight of my cycling year and there is no way I'd want to miss it!! Not going was the right decision, however disappointing it may be. I will miss the camaraderie of my friends, the challenge and the buzz of being one of a few thousand cyclist who attempt the Dunwich Dynamo but come next week when I am on the start line of the Brompton World Championships all this will be forgotten. Anyway there is always next year!